Antonio A. Oposa Jr, author of Shooting Stars and Dancing Fish: A Walk to the World We Want - a must read! SINGAPORE, 25 September 2017. Antonio. A. Oposa. Jr is no stranger to the legal and environmental community of the Philippines, and the world. Oposa has contributed much to the conservation of natural resources and the protection of future generations. So outstanding has been his relentless pursuit of environmental justice that he has not just earned the respect of ordinary people but also of high-ranking United Nations officials and chief justices. Oposa has received many awards. In 1995, he received “The Philippines’ Outstanding Young Man Award” for his work in public interest environmental law. In 1997, he was awarded the highest United Nations honor in the field of environment — the UNEP Global 500 Roll of Honor. In 2009, the Ramon Magsaysay Award, a prestigious Asian version of the Nobel Prize, was conferred to Oposa. If you were to bump into Oposa, you’d find no chip on his shoulder. I met Oposa in Singapore when he addressed the new undergraduates of the Master of Environmental Management (MEM) programme during the welcome ceremony on 9 August 2017 at the National University of Singapore. There he beseeched the students to pursue their upcoming studies with not just their minds but also with their hearts, keeping in mind the Law of Life. Tony Oposa is guest of honour at NUS' 2017 Welcome Ceremony for the new undergraduates of the Master of Environmental Management programme. Picture by Mallika Naguran. After all, the job of being an environmentalist is to look after the Land, Air and Water, which according to Oposa, is easier to remember by way of the acronym LAW, hence minding the Law of Life. Unfamiliar concepts such as LAW are what you’d come across when reading the new book, which is a compelling account of Oposa’s private thoughts and public intervention, meshed with creative spurts of poetry, philosophy and paintings. Tony Oposa's Shooting Stars and Dancing Fish is a must read. Photo by Gaia Discovery. Shooting Stars and Dancing Fish: A Walk to the World We Want was published by Ramon Aboitiz Foundation Inc. in 2017. It is not easy to describe the book’s form. The way the 260-paged book is put together demonstrates the interconnectedness of the living elements such as nature and ecosystems with human involvement, and impacts arising from the activities of people. Indeed the book is filled with pictures and stories. He related that the idea of the book was seeded during the production of his 2003 book The Laws of Nature and Other Stories. “There is a chapter in there on ecology, but few people have that edition,” he said. So he started work on his next publication to retell an old story but with a more compelling and urgent message. Nature education includes learning about water harvesting, storage and management at Tony Oposa's SEA CAMP. Photo by June Lavil Quinanola. According to Oposa, everything is connected. In Chapter Two, he writes how the Earth is comparable to the human body. Where the trees and forests are the heart and the lungs of the earth, “without which we have no air to breathe”. The land and the soil are the skin and flesh of the earth, providing much needed resources for food and shelter. The sea, lakes and rivers are the “blood and bloodstreams of life”. 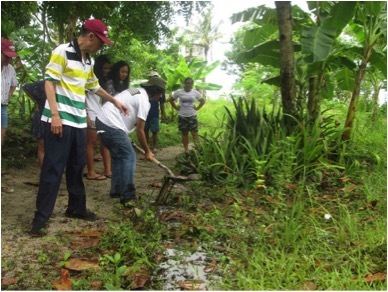 At Tony Oposa's SEA CAMP in Barangay, youths learn farming. Photo by Katrina Marie P. Pestano. Putting poison in any of the “indivisible three – in the land, air or water” would only introduce poison into our bodies, and “the curse of cancer eats away the life of many.” This fact is not new at all, yet in the name of economic progress, people harm others and even themselves by thinking about present needs only and with disregard to safeguards. Through a parable of the Wedding Feast in Chapter Three, Oposa probes readers into reflecting on what humans are in the context of nature, and the role humans play as either plunderers or caretakers of the Earth. Chapter Five’s Economics as Tuberculosis uncloaks jargons to reveal the vulnerable cores of existence due to status quo attitudes toward development and progress. He challenges norms such as developed economies (but they consume way more energy and materials than others and in an unsustainable fashion, he argues), economics (apparently defined as the efficient use of scarce resources, but look at environmental costs) and economic progress (consumption being the measure of economic development, but is over consumption necessarily a measure of progress? ). Consumption is dangerous, warns Oposa, if it only serves to use up to produce waste. An analogy for over consumption is “the bacteria Tubercle Bacilli, which eats up and wastes away the lungs and heart, and then other life-giving organs of the human body.” Over consumption is likened to tuberculosis eating away Earth, as land is mined, forests logged, seas overfished and air is choked. Developed economies, being “waste-driven” are no better than developing or non-developed economies, warns Oposa. It is misleading, and therefore to emulate developed economies’ modus operandi in seeking progress is dangerous. In this light, GDP should be revisited, according to Oposa. GDP, short for Gross Domestic Product, is typically assumed as the measure of a country’s economic progress. Given that over consumption is taken as progress even at the cost to society and the environment, Oposa opines that GDP should be re-labelled as “Great Disaster for the Planet”. The book is not all gloom and doom. Like dancing fish and shooting stars, it is also about life, energy, creativity, art, imagination, ideas, hope and aspiration. Sustainable solutions, principles and pathways are offered in Chapters 11 to 16, addressing a range of issues from urban living with transport management and edible gardens to restoration of degraded land and waters. We need to take action now, not tomorrow, urges Oposa. We need to think about what is important in life. “The time for talk is over,” says Oposa. 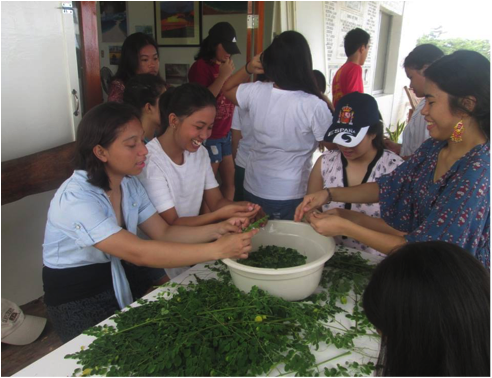 At the SEA CAMP in Barangay, youths learn how to cook what they farm and harvest as with this malunggay. Photo by June Lavil Quinanola. In Chapter 7 “War Stories”, Oposa describes the legal battles that he had fought, lost or won. This covers a series of cases involving forest protection, marine clean up, land reclamation, and more in the Philippines over two decades. At the end of each case, Oposa offers thoughtful reflections on the mistakes made, approaches taken and lessons learnt. These bring the cases to live, as they are highly instructive and applicable to any country facing similar environmental threats. Activists, conservationists, educators, parents, developers, solicitors, judges… in fact anyone with an interest in earth’s natural resources – for appreciation, production or protection – would benefit from hearing what Oposa has to say. Much thought is given to the spirit of law in the book as well. Can law be less reactive and more proactive to be effective in safeguarding people and the environment? “Environmental law must stop being a policeman of bad behaviour,” says Oposa. Chapter 13.3 tackles this conundrum as he observes that “the best form of law enforcement happens when there is general compliance.” Hence the need to make it a mode of conduct. Since his early years as an environmental lawyer, Oposa was moved by humans’ interaction in the form of give and take, discovering that we have taken a lot more than given. This is enacted through the “war stories” in his book, which are legal battles and court cases. What motivated him to be a lawyer in the first place? “I never wanted to be a lawyer; I didn’t know what else to do. I took up business administration but found that it was not meaningful. I found my life meaningless. I was rejected by MBA applications a few times,” said Oposa. He then thought about studying law because he thought it was a play with words. “But I soon found it so boring. So during law school, I took up some courses in music, literature and philosophy. Luckily I still managed to pass the bar!” He chuckled, reminiscing his days in Harvard Law School. “I went from criminal to corporate law until in the 1980s when there was such an animal called environmental law. From then on I never looked back,” he said. Oposa soon joined the ranks of global environmental lawyers with his outstanding achievements in defending children, the unborn and elements of nature in public interest litigations. In 1993, Oposa grabbed the world’s attention for his role in the landmark case Oposa v. Factora. The Philippine Supreme Court held that a group of minors had the right to sue on behalf of succeeding generations – this is because every generation has a responsibility to the next to preserve nature. In another case, Oposa had a ten-year battle with the Philippine government to clean up and rehabilitate Manila Bay. The Supreme Court rendered a judgement against 12 government agencies to legally obligate them to prepare an action plan with a budget, tasking and a timetable to clean up Manila Bay. Oposa has won landmark judgments in environmental jurisprudence, remarked Elizabeth Mnema, Director of Environmental Law and Conventions with UNEP, in the opening chapter. “These decisions have established precedents that are cited and emulated by courts everywhere in the world,” she said. But Oposa hasn’t stopped fighting. Today, he is fortifying the planet’s protection not by table thumping or filing affidavits, but by educating. The natural way. On an island in Bantayan sits an unobtrusive centre fringed by waving trees on the coast. This environmental training camp is Oposa’s passion — the Sea and Earth Advocates of Culture, Arts and Music for the Planet, in short known as SEA CAMP. Students of SEA CAMP can draw inspiration from the 10-hectare Tagasa Wetland Wilderness and Bird Park in the vicinity, and the marine life in the sea. Classes are taught in the open, under the trees or by the lagoon. If first began in 2002 as a bamboo school run by renewable energy that recycles its water. It suffered annihilation following Typhoon Frank in June 2008. The centre was built again but Supertyphoon Yolanda in 2013 wrecked most of that too except for a concrete structure incidentally called the Climate Change House. Instead of giving up, Oposa is building it again. And he can barely hide his excitement. At the SEA CAMP in Barangay, Dr Weena Gera’s Environmental Politics and Governance class from the University of the Philippines, Cebu poses for a picture with Tony Oposa (standing in the middle). “I just had a discussion with the architects with the masterplan. The new building will be shaped as an island!” Wait a minute. Was he talking about an island within an island? Crazy as that sounds, I am not surprised because this is Oposa. A man who thinks out of the box, better still, acts out of the norm. The preparation of youths to be leaders and effective environmental advocates is helmed by Oposa’s daughter Anna. Together, they have plans to officially launch the SEA CAMP on 22 April 2018, which is also Earth Day. Why have a nature-bound education centre? “The SEA CAMP uses art and music to protect the earth and nature, to change the heart and the mind,” he said. “You see, when you have a change of mind, it is for a day, but a change of heart is forever,” said Oposa. Photos of SEA CAMP courtesy of the various participants from the University of the Philippines..
To touch base with Tony Oposa for inquiries or donations, or simply to tell him a story for a change, please write to him or his assistant Paulo Burro at pacburro@gmail.com.